On a different Spice Trail. Muziris, the lost port, and Kochi reimagined. A tingle runs down your spine as you read the first of the verses. The awe the author reserves for it in these regnal chronicles reveal that spices occupied the same elevated position as gold and precious stones in 10th century BC, if not higher. The second verse gets more exciting as it proceeds to establish the trade links between Solomon’s kingdom (the Euphrates river in the north to Egypt in the south) and the ancient port of Muziris on the Malabar coast. Though the English verse is not exact about the location, etymological evidence exists in the Hebrew religious texts. A year before his death in ’07, historian P.M. Jussay had in an interview talked about his research on the Jews in Kerala and their arrival in these parts. The 86-year-old had slowly explained, “The words used in the Hebrew texts for peacock and ape are ‘tukheim’ and ‘kapim’ respectively. There are no such words in Hebrew. These words are formed by adding the Hebrew plural suffix ‘im’ to ‘tokai’ and ‘kapi’, the ancient Tamil words for peacock and ape. I concluded that they were sourced from Muziris, the great trading centre where (that ancient) Tamil was spoken. (Malayalam evolved much later, in the 14th-15th century AD),” he said. Traders must have taken back peacocks because they were exotic birds. And simians that sit against the sun were then considered useful animals to give direction on the high seas. For millennia, this fabled land, resplendent in gold and ivory, redolent of fragrant spices, had mesmerised seafarers. And like all fantastic legends, it was ruled by the most generous of rulers. India’s great epic poets, Vyasa, Valmiki and Kalidasa, mention it and it was well documented in Sangam and European literature. Poet Paranar wrote thus: “Sacks of pepper from houses are brought to the market; the gold barges at Muchiri (Muziris), where the music of the surging sea never ceases, where Kuttuvan (the Chera king) presents to visitors the rare products of the seas and the mountains.” The trade predates Solomon’s time, certainly to when the foundations of the three Abrahamic religions, Judaism, Islam and Christianity, were being laid. Moses was instructed in the uses of fragrant cinnamon (Exodus 30:23) in the making of the anointing oil. From the 2nd millennium BC onwards, Muziris greeted Babylonians, Assyrians, Egyptians, Arabs, Chinese, Romans and Greeks. However, in 1341, a great flood on the river Periyar inundated it and choked the mouth of the harbour, erasing it from the world’s map. In the event, Cochin emerged as the major port while the kingdom of Muziris was lost and forgotten. Recently, there has been a scramble to dig up both archaeological and etymological evidence, in a bid to rediscover histories and find Muziris. 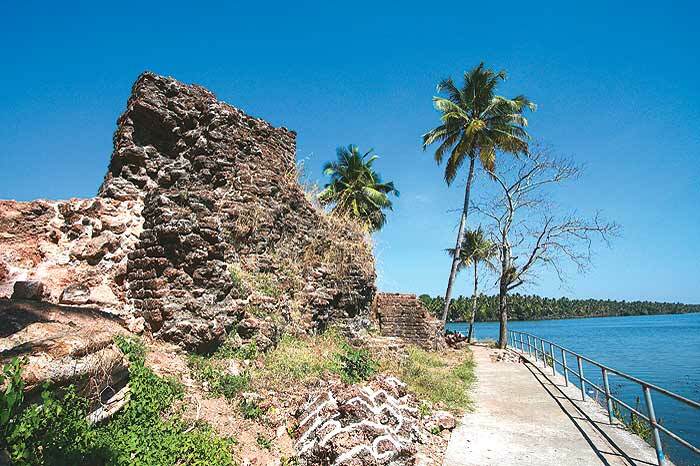 Old texts may have fired the imagination about this starting point of the Spice Route, but the exact geographical location of Muziris is still unknown. Dr S. Hemachandran, archaeologist in charge of the excavations in Kottapuram, says, “There is no physical evidence as to the exact location. It is spread over a large area.” Archaeologists believe that Muziris was located on the mouth of the river Periyar around 40 km north of Kochi, spread out over Chennamangalam, Chittattukara, Vadakkekara, Pallipuram, Azhikode, Methala, North Paravur, Kodungallur and Pattanam. In one of the biggest archaeological conservation projects in India, the state and central governments are investing `140 crore in the Muziris Heritage Project, encompassing six panchayats and two municipalities. Conservation consultant Benny Kuriakose says, “We have identified over 100 sites. Even though only eight are protected monuments, we are conserving all other sites according to international guidelines. There are layers of history here....” An enchanting riverine tour that connects the sites is part of the project plan. “Rivers and canals are being cleaned and jetties built for this tour. This is not a tourism project in the conventional sense as we are not putting up hotels. The success of this project is that it has created awareness in the local community. Like in the case of Cheraman Masjid, the masjid committee has decided to restore it to its original look with our guidance,” says Kuriakose. The unfettered exchange of trade and culture opened the space to all religions. In different times in history, Jews had fled their homeland and it was only natural that they came to Muziris and settled here. St Thomas, a disciple of Jesus Christ, landed on these shores in 52 AD, establishing the first church here. Legend has it that the last of the great Chera kings, Cheraman Perumal, abdicated his throne, travelled to Mecca, converted to Islam but died on his way back. In 629 AD, the first mosque in India, Cheraman Masjid, was built in Cranganore (now Kodungallur). What’s interesting about the original mosque was it was in the Kerala style and even had a hanging lamp. Coming back to the heritage project, the ancient synagogues in Paravur and Chennamangalam, both of which have heavily borrowed from Hindu designs with roof interiors embellished with flowering lotuses, are going through careful reconstruction. Excavations at Kottapuram fort are now throwing up interesting links to the past. The ancient markets of Kottapuram and Paravur—which thrive even today—and the Paliyam palace, the seat of the Paliath Achans who served as the prime ministers of Cochin, are also being restored. Though much of the Muziris project is still “under construction”, international interest has already started flowing this way. In fact, a detailed look at the restoration itself makes for an interesting tour. And so, this fabled port may once again bustle with business, perhaps even get back all those travellers from Greece, Arabia and China after all these years.